Accelerate Simulation Productivity with Abaqus FEA on Personal Clusters. Get simulation results in a fraction of the time! In today’s competitive world, every second counts. By running Abaqus FEA from SIMULIA, the Dassault Systèmes brand for realistic simulation, on affordable compute clusters, you can achieve significant time savings. Speed-up can be realized on all types of finite element analysis (FEA) models, with the most dramatic improvements achieved on medium-to-large-sized models. 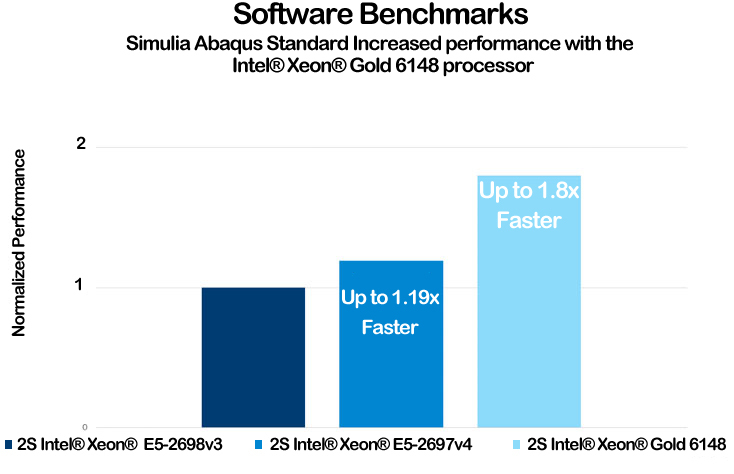 These benefits are due to SIMULIA’s efforts to optimize the parallel performance of its Abaqus FEA software running on powerful Intel® Xeon® processor-based personal clusters. The result is a comprehensive modeling and analysis solution that enables design engineering and research groups of all sizes to increase simulation productivity. Easy deployment on a powerful personal cluster. Get all the power of a high-performance Linux or Windows computing cluster in a new generation cost-effective system that’s surprisingly simple to use. With Intel Xeon processors, these systems make fast work of multiple simulations. Accelerated performance for realistic simulation. Want to learn more about personal clusters running Abaqus? Contact your local SIMULIA sales representative. Ready to see your performance gains on a personal cluster? Learn more and sign up now for a VIRTUAL TEST DRIVE.